Nearly 27 million people in the US are affected osteoarthritis, a degenerative joint disease. About 12% of osteoarthritis cases are a result of former injuries. Unrelenting cartilage destruction cannot be stopped by taking over-the-counter painkillers, such as anti-inflammatory drugs. These drugs only help to decrease the pain, and over time pain related to osteoarthritis only becomes worse. A team of researchers at Washington University School of Medicine in St. Louis have demonstrated the possibility of injecting nanoparticles into injured joints in mice and prevent inflammation right away after an injury, decreasing the cartilage destruction. I see a lot of patients with osteoarthritis, and there’s really no treatment. We try to treat their symptoms, but even when we inject steroids into an arthritic joint, the drug only remains for up to a few hours, and then it’s cleared. These nanoparticles remain in the joint longer and help prevent cartilage degeneration. It is most likely that an osteoarthritis patient would have suffered an earlier injury such as car accident, an ACL injury or torn meniscus in the knee, a fall, or other trauma. The body’s natural defense to such joint injuries is robust inflammation. Patients tend to rely on drugs such as ibuprofen and acetaminophen, and as pain worsens, they move onto steroid injections to provide pain relief; however their effects are temporary. In this research, the nanoparticles were injected following an injury. Within 24 hours, the nanoparticles began to tame the inflammation in the joint. 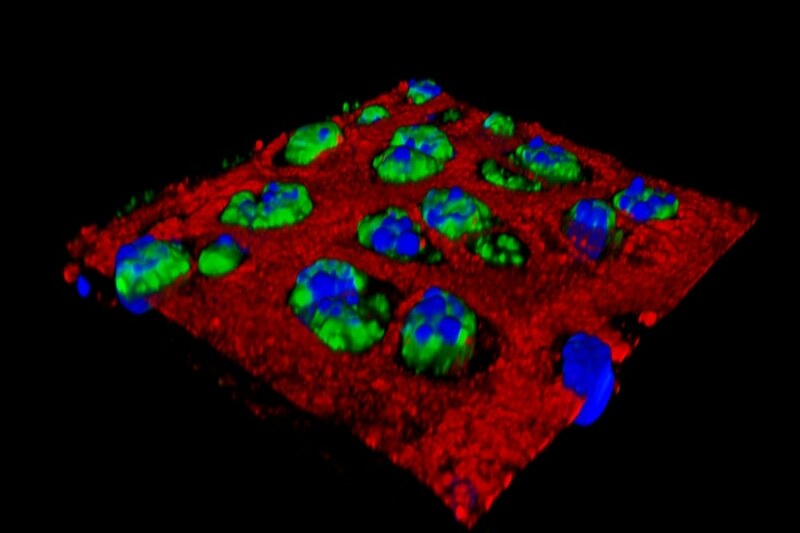 In comparison to steroid injections that rapidly disappeared, the nanoparticles lingered in the cartilage cells of the joints for weeks. The nanoparticles used here were over 10 times smaller than a red blood cell, which helps them enter easily into tissues. The particles possess a peptide created from a natural protein known as melittin that has been altered to enable it to stick to a molecule known as small interfering RNA (siRNA). The melittin delivers siRNA to the injured joint, hindering inflammation in cells. The peptide-based nanoparticle was developed by research co-investigators Hua Pan, PhD, an assistant professor of medicine, and Samuel Wickline, MD, the James R. Hornsby Family Professor of Biomedical Sciences. The nanoparticles are injected directly into the joint, and due to their size, they easily penetrate into the cartilage to enter the injured cells. Previously, we’ve delivered nanoparticles through the bloodstream and shown that they inhibit inflammation in a model of rheumatoid arthritis. In this study, they were injected locally into the joint and given a chance to penetrate into the injured cartilage. The nanoparticles were injected as soon as an injury occurred to prevent cartilage damage that ultimately results in osteoarthritis. There is still more to be researched regarding this approach, such as will it have an impact years after an injury, when osteoarthritis has developed in the joints causing serious cartilage loss. Nevertheless the research findings indicate that the nanoparticles, if injected immediately after occurrence of joint injuries, could help retain cartilage capacity and prevent the development of osteoarthritis. The inflammatory molecule that we’re targeting not only causes problems after an injury, but it’s also responsible for a great deal of inflammation in advanced cases of osteoarthritis. So we think these nanoparticles may be helpful in patients who already have arthritis, and we’re working to develop experiments to test that idea. The research results were reported in an online paper titled ‘Suppression of NF-kB activity via nanoparticle-based siRNA deliver alters early cartilage responses to injury’ on September 26 in the early edition of the Proceedings of the National Academy of Sciences. The authors include Yan X, Duan X, Pan H, Holguin N, Rai MF, Akk A, Springer LE, Wickline SA, Sandell LJ, and Pham CTN. This research was supported by the National Institute of Arthritis and Musculoskeletal and Skin Diseases; the National Heart, Lung, and Blood Institute; and the National Institute of Diabetes and Digestive and Kidney Diseases of the National Institutes of Health (NIH).